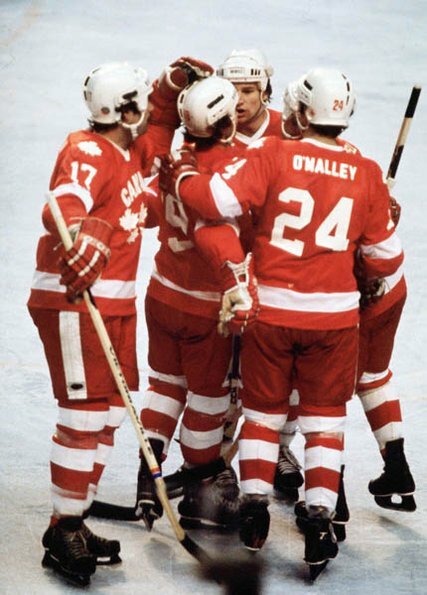 The 1970s were the lost decade for CANADA in terms of ice hockey at the Winter Olympic Games. Canada had been given assurances by the International Ice Hockey Federation that at least a limited number of minor league professionals would be allowed to compete at the 1970 IIHF World Championships, which were slated to be held in both Montreal and Winnipeg that year. When the IIHF later reneged on the agreement, the country that had founded the sport withdrew from international ice hockey altoghether and the World Championships were hastily relocated to Sweden. As part of the negotiations to stage the inaugural Canada Cup, it was stipulated that professional players would become eligible at the World Championships starting with the 1976 IIHF tournament in Poland. 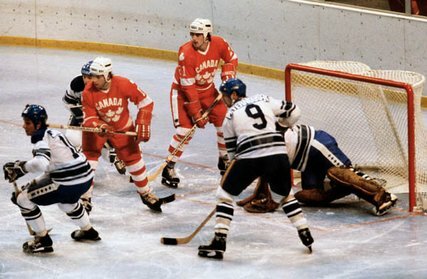 Canada, who agreed to return to international competition as part of the deal, sent its first contigent of professional players (all from the NHL) to the 1977 World Championships held in Vienna, Austria. After having skipped the Sapporo and Innsbruck tournaments, the Winter Games in 1980 would mark the first Olympic entry of an ice hockey team from Canada in a dozen years. The captain of the Canadian squad at Lake Placid was none other than 39-year-old defenseman TERRY O’MALLEY, who was making his third Olympic appearance. O’Malley skated for Canada at both the 1964 Innsbruck and 1968 Grenoble Games, respectively. Easily the oldest Canadian player at Lake Placid, O’Malley had already collected a bronze medal for his country in the French Alps. O’Malley later spent seven seasons in the 1970s as a player-coach in Japan for the Tokyo-based Seibu Tetsudo and Kokudo Keikaku clubs before rejoining the Canadian national team program. BILL BAKER fires a shot for the University of Minnesota against their in-state rivals, the University of Minnesota-Duluth, in WCHA play. 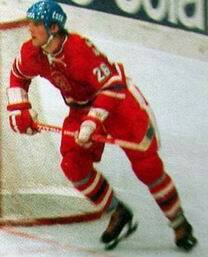 Baker was an All-American defenseman for the Golden Gophers his senior season of 1978-79 and represented the United States at the 1979 IIHF World Championships in Moscow. The UNITED STATES goaltender is seated with the rest of the blue shirts on the end of the bench. The American net is left unguarded, lifted in favor off an extra skater with the upcoming faceoff at the other end. Forty-one seconds remain in the match with SWEDEN, which comes a day before the official opening ceremony of the 1980 Winter Olympic Games in Lake Placid, New York. The University of Minnesota’s BILL BAKER is on hand to hammer the puck past a partially-screened PELLE LINDBERGH in the Swedish goal to lift the United States level at 2-2. For the Americans, the tie felt more like a victory. United States coach HERB BROOKS had calculated prior to the tournament that the squad would require two points from its first two Blue Division matches with Sweden and Czechoslovakia in order to have any real opportunity to advance to the medal round. The United States entered the 1980 Winter Games at Lake Placid seeded seventh out of twelve teams; Sweden were ranked third. It was certainly among the most pivotal matches at the 1980 Winter Olympic Games in Lake Placid. The Czechoslovaks, despite a disappointing 7-3 loss to the upstart United States in their second game, still had all to play for on the last day of round-robin competition. The IIHF world champions from 1976 and 1977, runners-up in 1978 and 1979, as well, were still a powerful, veteran squad featuring MILAN NOVY as well as the all-brother line of ANTON, MARIAN and PETER STASTNY. The defending silver medalists from the Innsbruck Games would qualify for the medal round with a victory over Sweden in their final round-robin game. The Swedes, for their part, required a tie at the minimum against Czechoslovakia to move into the medal round at Lake Placid. Sweden, thanks to their 2-2 draw with the United States on opening day, stood one point ahead of the Czechoslovaks in the Blue Division standings. Still, the Swedes had managed but one tie with seven losses their last eight games at the past four IIHF World Championships versus Czechoslovakia. What’s more, unlike at the Winter Olympics, the Swedes used National Hockey League players at these World Championships, which was allowable since 1976. Novy did notch a goal for Czechoslovakia as did JAROSLAV POUZAR, who ended up the leader at Lake Placid with eight goals. And the Czechoslovaks did enjoy a decided 43-26 advantage in shots-on-goal. But Czechoslovakia’s continuous medal run since 1964 would not continue, however. PELLE LINDBERGH, the Philadelphia Flyers’ second round draft choice (# 35 overall) in 1979, would prove to be the end of the line. The 20-year-old AIK Stockholm puck stopper halted 41 Czechoslovak shots in all. In the meantime, the Swedes found the net four times through MATS AHLBERG, LEIF HOLMGREN, MATS NASLUND and PER LUNDQVIST. The 4-2 result sent Tre Kronor through to the medal round. Sweden ultimately secured the bronze medal at Lake Placid in 1980. 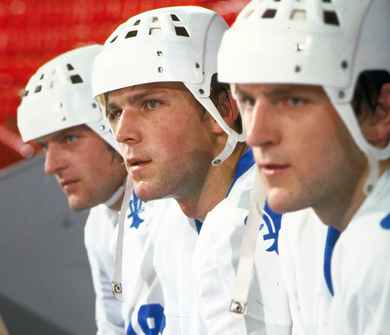 MARIAN STASTNY (left), PETER STASTNY (center) and ANTON STASTNY (right) for the Quebec Nordiques in the NHL. There have been many brother combinations from a host of nations that have competed in the ice hockey tournament at the Winter Olympic Games. There has, however, only been one all-brother forward line to skate in Olympic history – the Stastnys. Peter, the center, finished among the top scorers at Lake Placid with 14 points (7 go 7 as) for Czechoslovakia. Marian, the right wing and eldest, also hit double-digits with 11 points (5 go 6 as). Anton, the left wing and youngest, chipped in with eight points (4 go 4 as). The Stastny Act appeared just one time at the Olympics. Anton and Peter bolted from their club, Slovan Bratislava, after the finals of the European Cup at Innsbruck, Austria, in August of 1980 and signed with the Quebec Nordiques of the National Hockey League. Marian, who initially stayed behind and was suspended by Czechoslovak hockey authorities, joined his brothers in Canada a year later. 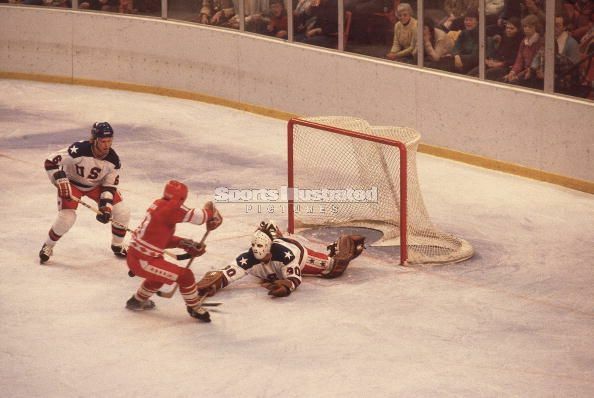 The puck slides anxiously through the crease of Soviet goalie VLADIMIR MYSHKIN (1) during the third period of the United States' 4-3 victory over the USSR at the 1980 Winter Olympic Games in Lake Placid. The United States had lifted their goaltender in favor of an extra skater at the end of their opening game with Sweden. And so it was a mystery for many when the Soviet Union left VLADIMIR MYSHKIN in the net for the last minute of their famous 4-3 upset loss to the United States at Lake Placid in 1980. What on Earth, some wondered, could USSR coach VIKTOR TIKHONOV have possibly been thinking? Goal differential — the obvious answer for those familiar with the tournament format. The reality of another day to be dealt with in the medal round provided too many possibilites. The fact a U.S. victory over Finland was far from guaranteed as well as the goal differential matter could not be left out of considerations. 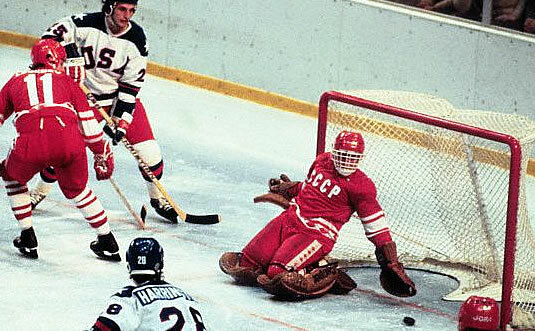 All conspired to see the Soviet goalie stay put at the end of the USSR’s loss to the United States at Lake Placid. United States goaltender JIM CRAIG featured the classic molded fibreglass facemask at the 1980 Winter Olympic Games in Lake Placid, New York. 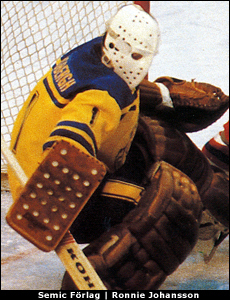 Whereas many goaltenders in the National Hockey League and elsewhere made an art out of decorating goalie masks during the 1970s, the former Boston University All-America brandished a simplistic, almost all-white look. The only blemish, an Irish shamrock next to the left eyehole for good luck. Jim Craig, unfortunately, did not enjoy anywhere near the success in the NHL as he did at Lake Placid in 1980. Craig played exactly 30 NHL games (3.77 avg, 0 so), the same total as his shirt number for the U.S.A. at the Olympics, for the Atlanta Flames, Boston Bruins and Minnesota North Stars in his four seasons as a professional. Craig did play for the United States at the B pool of the 1983 IIHF World Championships and was named to the tournament all-star team. 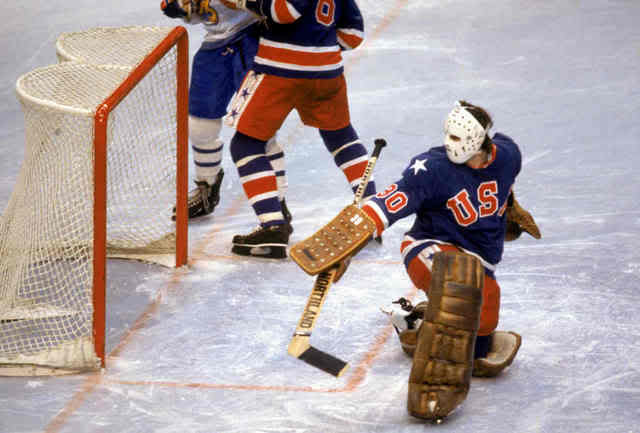 United States netminder JIM CRAIG thwarts the Soviet Union's Lativan legend, HELMUT BALDERIS (19), as defenseman BILL BAKER (6) observes in the famous 4-3 upset of the USSR by the Americans at the 1980 Winter Olympic Games. At Lake Placid in Craig, a 1977 fourth round NHL draft pick (# 72 overall) of the Atlanta Flames, the Soviets ran into one genuine red hot goaltender. Of course, any proper discussion of the all-time greatest single-game goaltending performances at the Winter Olympic Games could not continue without the name JIM CRAIG joining the conversation sooner as compared to later. The United States’ startling defeat of the Soviet Union at the 1980 Lake Placid Games is regarded by many to be not just the most monumental upset in the history of Olympic ice hockey, but, indeed, the most significant giant-killing in all of sport. The ultimate David slays Goliath game. The Soviet squad at Lake Placid, winners of four consecutive Olympic tournaments, was considered to be the most powerful hockey team on earth after having spanked the National Hockey League All-Stars 6-0 in the deciding match of a best-of-three Challenge Cup series twelve months earlier at Madision Square Garden in New York City. The United States, by contrast, was a collection of collegians in an era when American college players were lucky enough just to reach the NHL and maintain full-time position. The U. S. had taken on the USSR at Madison Square Garden in an exhibition just a few days prior to the Lake Placid Games and had been mangled 10-3. The Soviet attack lost no steam in Lake Placid as the USSR launched 18 shots at the former Boston University All-American netminder in the first period of the famed medal round match alone. Craig managed to keep sixteen out, however; his efforts after the Soviets had gone ahead 2-1 courtesy a SERGEI MAKAROV goal were imperative. Of particular note was Craig’s point blank save from legendary Soviet captain and international hockey’s all-time top goal scorer, BORIS MIKHAILOV, with time winding down in the opening frame. Montreal Canadiens goalie KEN DRYDEN, doing the ABC Sports color commentary for the American television audience, pointed out prophetically at the time of the Mikhailov robbery that the Soviets failure to extend its lead could manifest itself to be extremely important — U. S. center MARK JOHNSON proved the Hall of Famer’s theory correct with a fortuitous goal just one second from the end of the first period. The Soviets quickly regained a 3-2 advantage just two minutes after the first intermission when ALEXANDER MALTSEV made easy work of his one-on-one with Craig. Unfortunatley for the USSR, though, a familiar story fashioned itself by the end of the second period. The Soviet Union had outshot the United States 12-2 the second stanza but, despite a lop-sided 30-10 margin at the end of forty minutes, held a very slim lead of just one goal. Indeed, the Americans were able to rally for a pair in the third period on just six shots. At the other end, Craig was able to turn back all nine Soviet attempts on goal and pushed his total to 36 saves for the length of the game. Although Johnson had scored twice and it was a goal from the U. S. captain MIKE ERUZIONE that had provided the winner, there was absolutely no question which United States player had been the difference. Just before the start of the 1984 Sarajevo Games, Canadian hockey official ALAN EAGLESON had insinuated that the United States had used ineligible players to win the gold medal at Lake Placid four years earlier. The ice hockey tournament at the Winter Olympics was supposed to be restricted to “amateur” players only. But, Eagleson charged, United States defenseman KEN MORROW had entered into a verbal agreement with the New York Islanders of the National Hockey League ahead of the 1980 Games and was, therefore, ineligible to participate as a professional. 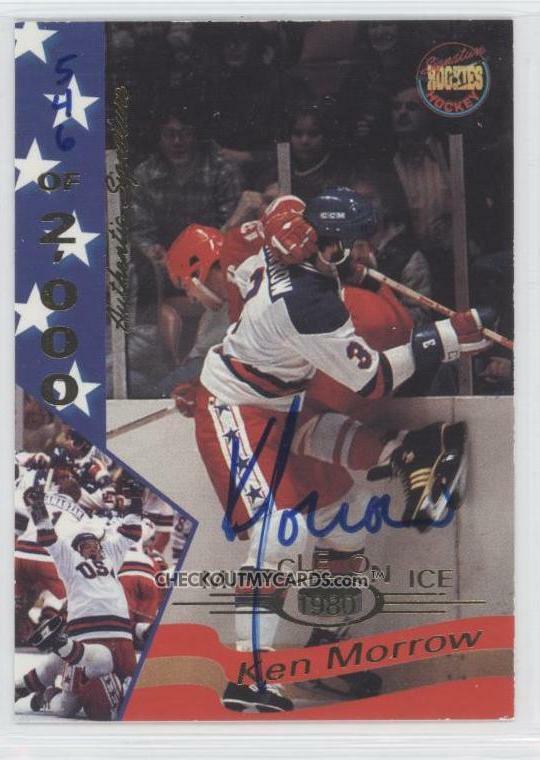 The ironic part of this whole affair was that, indeed, Morrow HAD indulged in negotiations with the Islanders before signing on to skate the 1979-80 season for the U.S. National team that would be competing at Lake Placid. Morrow, a standout at Bowling Green University, had played his four years and collected his degree as the real world beckoned back in the summer of 1979. The 6’4″ 210 lbs defenseman had dealt with the passing of his father his freshman season and the Morrow family could certainly have benefited immediately from an NHL signing bonus and playing contract. The Islanders, with a fourth round selection (# 68 overall), had made Morrow the earliest selected college player, Canadian or otherwise, in club history and were known to be ready to come to terms with the native of Davison, Michigan. But then again, the coach of the United States Olympic team, HERB BROOKS, was desperate for the bearded behemouth to bolster his blueline at Lake Placid. So it was ART KAMINSKY, the defenseman’s agent, who put together the master plan then. First, Kaminsky was able to negotiate with the Islanders for a mutually agreeable verbal contract that would be signed immediately following the Olympics. Next, Kaminsky came up with the idea of an insurance policy to cover an NHL signing bonus and two years’ salary to cover any concern regarding injury. Finally, to bring everything all together, Brooks and Kaminsky were able to convince the United States Olympic Committee to foot the bill for the insurance premiums despite initial reluctance.